Terry Stanton, longtime veteran jockey at Texas racetrack, has retired from race riding and will pursue other interests. The native Texan began his career riding Quarter Horses and has been one of the top jockeys in Texas for the past decade. He concluded his career with a remarkable record of 1,321 wins from 10,287 starts. He had 1,254 seconds and 1,205 third place finishes. His mounts earned a total of $11,600,245. Win or lose, the affable Stanton always has a smile on his face and continued to be grateful for his health. He battled back from two serious injuries suffered in 1999 and 2001. He missed the majority of the 2001/2002 season as a result of an injury to his leg and ankle in a starting gate accident in 2001. Stanton underwent surgery and could not bear weight on his left leg for three months. But the following year, he exceeded his expectations in winning the leading rider title at Sam Houston Race Park in a tie with his good friend, Don Simington. 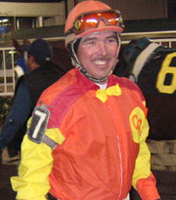 Stanton's sense of humor is just one of the reasons he has been one of the most popular members of the Sam Houston Race Park jockey colony. The native Texan has ridden at the northwest Houston racetrack since its opening in 1994 and is fourth in the all-time standings with 444 wins and $4,182,897 in earnings. Stanton is a devoted family man and looks forward to spending more time with his wife, Michelle, and their 4-year-old daughter, Teri, in Waller, Texas.